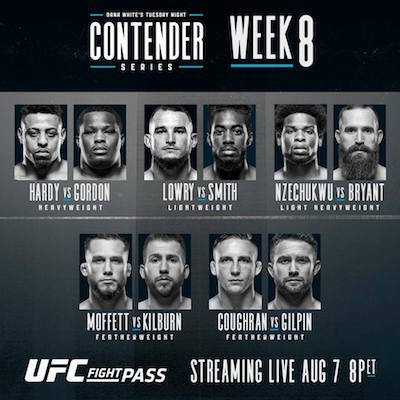 Week 8 of Dana White’s Tuesday Night Contenders Series takes place this evening from Las Vegas. Former NFL star Greg Hardy returns in the main event to take on North Carolina’s Tebaris Gordon in a heavyweight showdown. Clarksville, Tennessee featherweight standout Jacob Kilburn gets his shot at a UFC contract as he takes on MMA Lab product Bobby Moffett.